NO TIME TO BUILD ONE YOURSELF? SAVE 80 - 90% OFF THE PRICE OF A CAT TREE! Do you want to make your own cat tree and cat condo furniture? Have you looked in your local pet store and seen the poor quality and overpriced cat furniture they are selling? Now you can BUILD YOUR OWN CAT TREE AND CAT CONDO FURNITURE using our easy to follow cat condo plans. Plans include step-by-step directions, material/cut list, color pictures, tips, and carpeting guide. 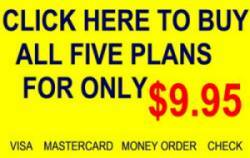 For just $9.95, our plans walk you through step by step on how to make five different cat trees. All five cat tree plans come on one CD and are available for instant download with purchase. That's right, you get both a CD in the mail AND the ability to download the plans. No need to wait for the CD to arrive in order to view the plans. You can start building your cat condo today. The cat condo plans come in PDF format. (what is PDF format?). All five cat condo plans include step by step directions, color pictures of actual cat furniture being built, a material/cut list, and a detailed carpetting guide. Making your own cat condo has never been easier. It's a lot of fun and can save you a lot of money. Get started today! >WHY BUILD YOU OWN CAT CONDO? Cat Trees in the pet stores are very expensive. Cat Trees can cost upward of $400. You can build it yourself for a fraction of the cost. Most Cat Trees that are bought in the store are made of low quality materials. Next time you are in the local pet store, check out the poor quality of the cat trees that are being sold - press board, cheap carpet, and poor workmanship. By building it yourself, you can use quality woods, better construction techniques, and higher quality carpet to ensure the tree will last. Building a cat tree is a fun activity. You can enjoy making it and your cat(s) can enjoy using it. We have already designed, built, and tested each cat tree. Take the guess work out of building a cat condo. Someone else has already figured it all out! Using the step by step instructions in these plans, building a cat condo will prove to be a trouble-free experience. Your new cat tree will surely be a hit with your cat(s). A cat tree will stimulate your cat and make for a more healthy cat. Give your cat a place he or she can call their own. Most of the cat condos include a sisal rope scratching post. The cat condo doubles as a cat scratcher. Give your kitty an alternative to the arm of the couch. All of our cat furniture plans include detailed step by step directions on how to build each cat tree. Color pictures are provided next to the directions that show an actual cat tree being built. Each cat condo plan lists the materials that will be needed to build the cat tree such as wood glue and screws. A cut list is provided that lists the quantity, sizes, and types of wood that are needed such as (4) 7" 2x3s or (1) 24" x 24" 3/4" plywood. The material and cut list is provided at the beginning of each plan so you can gather all the materials and make all the cuts before you start building. All cat tree plans contain between 40 to 80 detailed color pictures of an actual cat tree being built to help build your cat tree. A carpeting guide is included in each cat tree plan that helps you carpet your tree. The guide includes directions and pictures. Purchase the plans using your mastercard or visa (check or money orders are also accepted). After payment is received, you will recieve an email from our automated servers. The email will contain a password and instructions on how to download the cat condo plans. The email should arrive within 5 minutes after purchase. Click below to start the ordering process. Copyright �2003-2006 CatCondoPlans.com. All Rights Reserved.